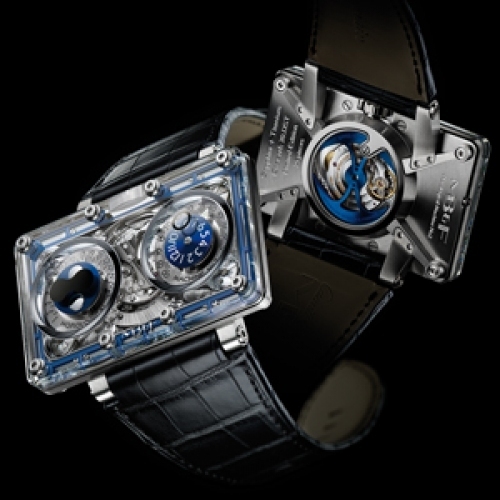 Thanks to the sapphire case, the richness of this timepiece’s 349-component movement is revealed in all its crystalline purity. 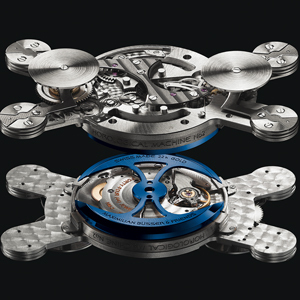 The construction of the Horological Machine N° 2-SV is an amazing feat considering its complex 3-dimensional architecture and the extreme hardness of the sapphire, a very difficult material to work with. It has pushed back the very limits of technology, an achievement that only the movement can rival. It is, in fact, the only mechanical movement in the world to offer an instantaneous jumping hour, concentric retrograde minutes, a retrograde date, a double-hemisphere moon phase, and automatic winding. The patented asymmetrically-toothed gear-trains used for the jumping hours and retrograde minutes guarantee a remarkable level of precision and performance and use very little energy. Limited series of 25.